OSHA standards for flooring roughness are a set of recommendations to provide slip-resistant walking surfaces in the workplace, and are not meant to be absolute. The United States Occupational Safety Health Administration acknowledges that slippery conditions vary from surface to surface. Conditions vary even on the same surface, depending upon the conditions of the flooring and the type of footwear worn by employees. Because of the many factors involved, OSHA has never adopted an absolute standard for flooring roughness. OSHA's General Requirements for Walking and Working Surfaces states the recommendations for static coefficient of friction (COF) under Appendix A to Subpart D. OSHA standards for flooring roughness are not mandatory, and are based upon a study done by the University of Michigan and reported in Work Surface Friction: Definitions, Laboratory and Field Measurements, and a Comprehensive Bibliography. The coefficient of friction may be defined as the force necessary to hold two materials (the foot and the floor) together and the maximum force necessary to resist sliding. The University of Michigan study recommends a COF of 0.5 as a reasonable guide to provide proper slip resistance, although certain activities, such as carrying items, pushing or pulling objects, or walking up on down-inclined surfaces may require a higher COF. The Americans with Disabilities Act (ADA) recommended that the COF standard should be raised to 0.6, but it remains only a suggestion, and is not a law. The slipperiness of flooring can vary depending on the conditions of the surface and the type of footwear worn by employees. Slip-resistant flooring that is serrated, punched, or textured to add to its roughness may offer some anti-slip protection, and OSHA recommends that it be used in wet, oily, or dirty work areas. 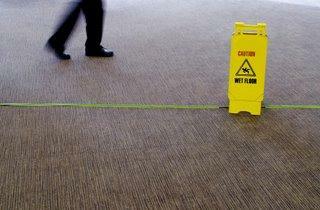 Slip-resistant footwear can also help reduce slip and fall hazards in the workplace. Ironically, a floor that is too rough can also be a slip and fall hazard, according to Slip Resistant Flooring, a 2003 report by the Society for Protective Coatings. The report states that flooring with a high static coefficient of friction (SCOF), 0.8 to 1.0, is actually more of a slip and fall hazard because the roughness of the surface can catch the sole of footwear and cause the person walking on the surface to trip and fall. The weight of the individual, as well as the footwear worn and the speed at which he is walking all contribute to his potential to slip and fall. The various shapes and sizes of employees affect their traction and the likelihood that they will slip and fall. Generally speaking, the larger the person, the more traction they have and the less prone they are to falling. The material, texture, cleanliness, and amount of wear of the floor surface can determine its slipperiness. A well-worn floor is often "polished" and more slippery than it was when it was new. The porosity of the floor will also affect its slipperiness. For example, a concrete floor will absorb water, while one coated with an epoxy will allow water to collect on the surface of the floor, increasing slipperiness. Environmental conditions, such as the temperature and humidity, also determine how slippery a surface may be. As the temperature drops, most surfaces will become harder and more slippery. Factor in moisture from humidity and wet conditions from the workplace itself, and it becomes obvious that the environment impacts the slipperiness of flooring. While OSHA does not have an absolute standard regarding the roughness of flooring, its recommendations for a coefficient of friction of 0.5 are a reasonable standard. Other factors, such as the type of flooring, the employees and their footwear, as well as the environment of the workplace should also be considered when evaluating the non-slip qualities of flooring.